12 blocks. 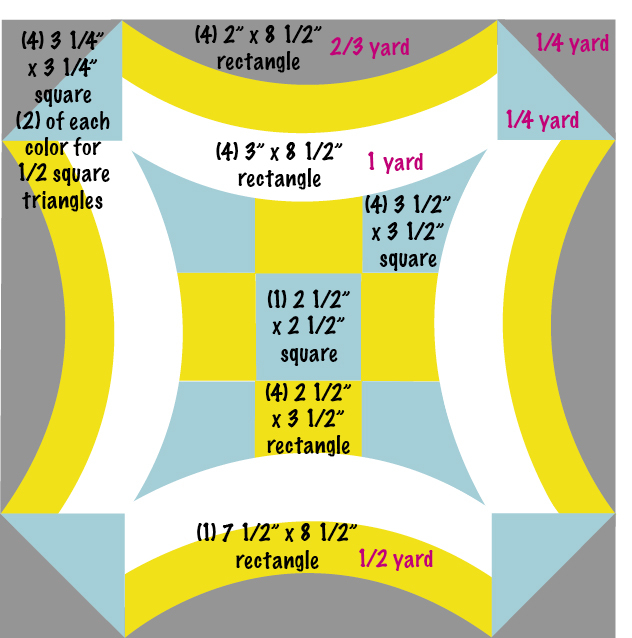 Of course depending on how many blocks you plan on making will change the yardage but this will give you an idea anyway and just because the diagram makes sense to me, in may not to you. Please let me know. I figured most of you will be using different fabrics for the nine patch's, but if you would like yardage for that, let me know. Remember the finished (after sewed) size of the block will be 12". Now on to sewing curves! Are you intimidated by sewing curves? Oh....please don't be!! I was so intimidated by curves that I refused to even try it, never was I going to sew curves, I would have rather APPLIQUED curves than sew them! Yep! All the curves on these blocks were appliqued, by me! Hours and hours and hours.....not saying I didn't enjoy it, but all because I was too scared to try sewing curves. ....so moving on, I think the best demonstration on how to sew the particular curve, cut from the Quick Curve Ruler is to show you my Professional Video (kidding)! Ugh...anyway you'll get it once you see it and if you've all ready watched it, well then your ready to start sewing curves! Oh Ya...and I have two flikr groups, one for Sew Kind of Wonderful Quick Curve Ruler Quilts and the other for the Urban Nine Patch Quilt Along. Oh, please...please go and join them! !